Hearing transcripts and evidence relating to Adnan Syed’s 2016 reopened Post Conviction / Evidentiary hearing (PCR2). Before Serial podcast was released, Adnan’s attorney had already submitted a(nother) appeal for Post Conviction Relief (PCR) and after several stages of legal arguments, Judge Martin Welch agreed to reopen the case. A five day hearing was held in February 2016 at the Circuit Court of Baltimore City so that new evidence could be added to the record and the testimony of new witnesses, including Asia McClain, could be heard. This page contains links to the transcripts of that 2016 hearing, testimony from nine witnesses over four and a half days, as well as opening statements, closing arguments, and many bench conferences with the attorneys and Judge Welch. We’ve broken them up into individual witnesses and chunks of argument, to save you from downloading 30MB just to read a few pages. Below the records of each day are details of evidence discussed in Court each day. We’ve listed and linked the evidence which was listed on the transcript index as marked or admitted into evidence for each day of the hearing. There were many more documents discussed each day than that, either those that had been admitted earlier in the hearing, or that seem to have been agreed upon outside the court, or testimony from the second trial, or the first PCR hearing, or items already in the Court’s “record” by attachment to a legal filing along the way. The discussions you read on the page often make a good deal more sense if you can refer directly to the evidence, so we have listed and linked all the items that we could find. Judge Welch asked both parties to submit lists of witnesses and evidence in advance. The defense submitted exhibits PC2-01 to PC2-39, including many items already part of the record. When these are raised in the transcript text they are generally well described and clear references are given, which would have helped the witnesses, Judge Welch, the court Clerk and opposing counsel, and a great help to later readers of the transcripts. After the defense had made their Opening Argument, the State then produced exhibits they wanted to submit: two files, known as Binder A and Binder B. Their argument, for admission, was that these contained parts of the defense file (Gutierrez’ file) and State’s own records that Gutierrez may have seen (see Day 1 for more details). Although relatively few of the pages were ever referred to, Judge Welch eventually allowed both Binders to be admitted. Many documents referenced by the State are from these binders. Binder page numbers were originally requested and promised, but not always provided, though a page ref is only helpful if, like Judge Welch, you also have the full copy to reference. Descriptions were variable in quality and without the benefit of being in the courtroom to see overhead displays, or having the actual document that was shown to the witness it can be less than clear which file is being referenced. It seemed possible the Binder B references might match up with State files that were known and had sequential numbering, such as the Baltimore Police MPIA files, and we know from later exhibits, that one MPIA file, from 2015, was indeed used a source for Binder B. Unfortunately cross checks with that MPIA show that the numbers cannot be mapped from one to the other, as hundreds of pages were removed and what remained was reordered. We cannot extrapolate what the unknown pages of Binder B might be. All these further documents discussed are listed, by day, under Other Evidence Discussed, in order of appearance (bar repeats). Transcript pages are shown in bold after each item, e.g. (p123) but just show when the item was introduced, or reintroduced, not every single page where it was mentioned. A fax from Gutierrez to Terri Kaye of AT&T, dated Oct 11, 1999, asking for information about cell sites mentioned by Waranowitz to the prosecutor Urick. Only the covering letter is available, not the subpoena or fax transmission record. Another Gutierrez team fax to Kaye of AT&T, dated one day after the fax above, asking her to “contact Mr. Lambda [Waranowitz’s supervisor] directly ” and enclosing a subpoena “directed to Bill Lamda.” which might be the same one mentioned above. these descriptions may cover between one and four separate documents. 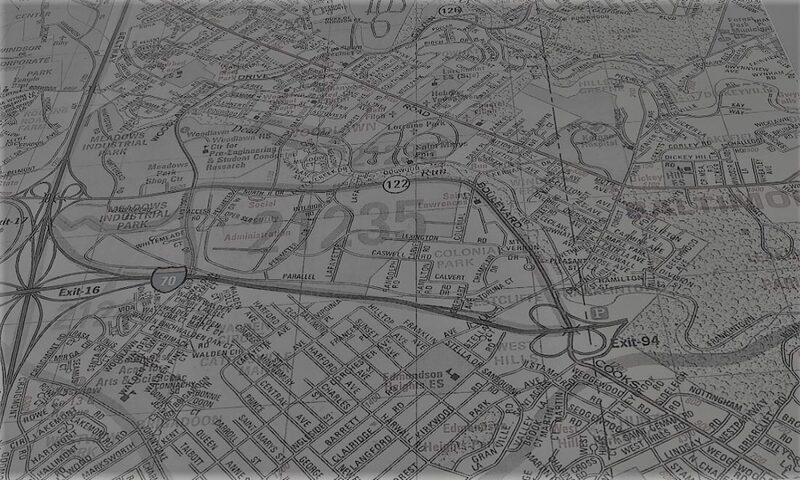 A fax dated Dec 7, 1999 from Waranowitz at AT&T to Gutierrez’ office, including some maps and a frequency plan. Pages available: 2 (cell site address list), 3 and 4(maps), and 6, 7, 8, 9 (frequency plans). B-0358 to B-0377, probably, (20 pages), a fax from AT&T to Ritz, Feb 17, 1999 enclosing cell phone records. 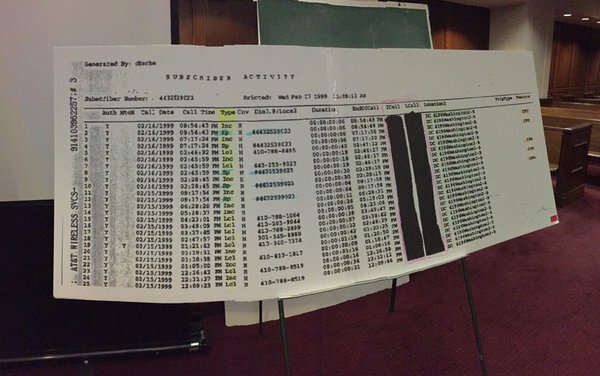 The 15 column, redacted version of activity/phone records plus “Subscriber Information” (19 pages MP15 1388-1406). 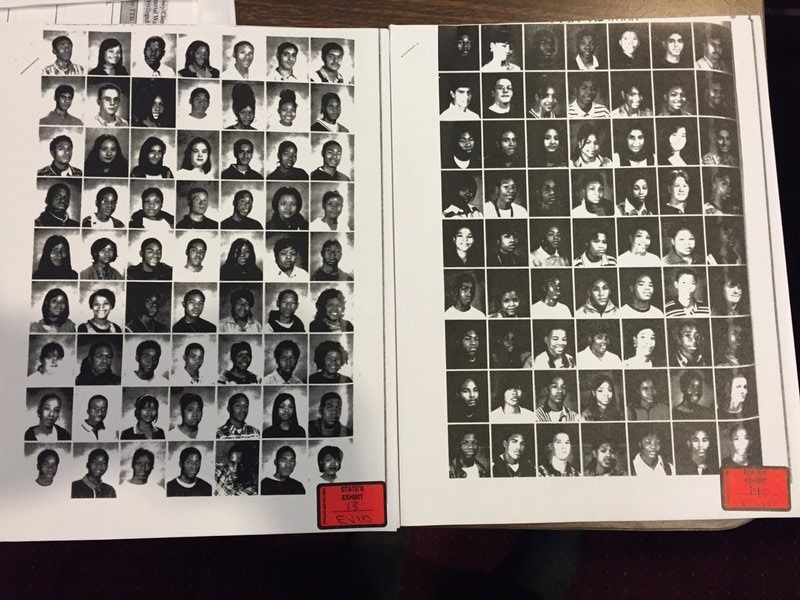 The fax cover shows 20 pages but only 19 are present in the MPIA file. B-0397 to B-0420 (24 pages), a fax from AT&T to Ritz (same date as previous so likely Feb 22). 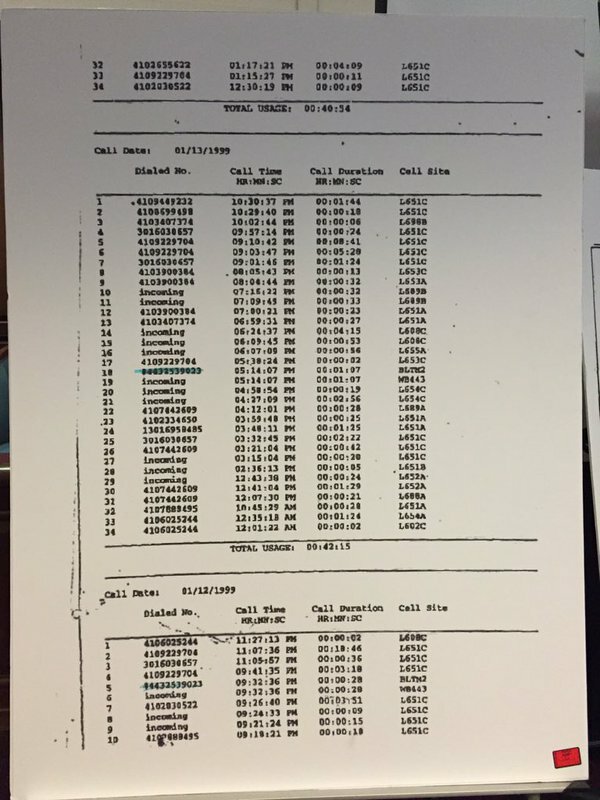 Adnan’s phone records, the 5 column version. The actual MPIA copy (22 pages, MP15 1416-1437) is very similar but is missing two pages for Jan 12-14. In the BPD file those 2 pages are within another fax, from BPD to AT&T, (2 pages MP15 1479- 1480), but that fax isn’t described here. At one point Vignarajah also says that this document is 27 pages long. 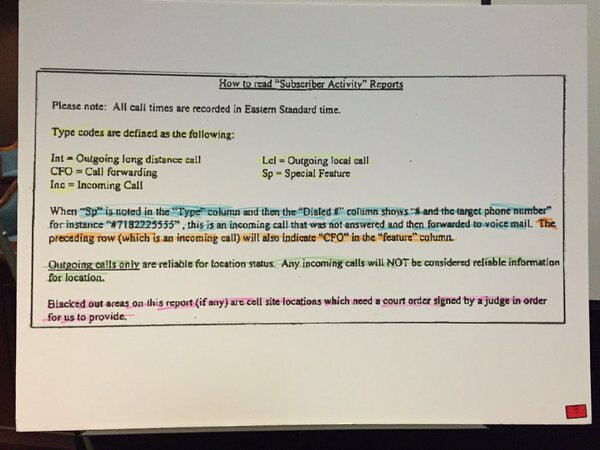 B-0429 to B-0446 (18 pages), a fax from AT&T to Ritz enclosing various elements of Yaser A’s cell phone records on Mar 15 (18 pages MP15 1456-1473 – redacted). The original document is 21 pages long, but as the witness pointed out, the State removed 3 pages, 19, 20 and 21. These were MP15 1474-1476, showing Yaser’s call records from 2/19 to 2/26. The missing section is labelled “SUBSCRIBER ACTIVITY” in the 15 col redacted, style like the first fax of Adnan’s records. We have assumed that the removal of those 3 pages was a mistake, and that no other subsections of this exhibit were “culled” in the same way, but even so, the combined length is only 84 pages. Which leaves 33 pages unaccounted for, compared to the 117 pages in Vignarajah’s original “B-0357 to B-0473”. In this particular section of Binder B it is very clear that the MP15 page numbering jumps back and forth, and the State moved files around. Sometimes the reason for this is apparent, like reordering pages that BPD had taken out of one file to use in another, other times it isn’t clear why. Whatever the intention in practical terms it makes it tricky to establish what the missing 33 pages are because we can’t simply map one file onto the other. Witness 8 (State): Chad Fitzgerald, FBI and Expert in Cell Phone Analysis. Syed Ex. PC2-30 David Irwin’s CV. Not available. (p160). Syed Ex. PC2-45 State’s Expert Disclosure Notice from January 2015. Not available (p213) . Syed Ex. PC2-48 Email from Waranowitz to Brown, circa 2015 or 2016. Not available (p227, 233). State’s Ex. A-0284 to A-0292. A 9 page defense “Witness List” in “vertical format” with Urick and Jessamy shown on page 1. (p65, 67). Not available. This page is a work in progress, we will update and expand the sections below when we can. Media coverage and videos are available via Media Coverage page, links will be added here in due course. We’d especially like to thank all the people who helped us collect these files, particularly members of the press who covered the hearing in articles, newscasts, YouTube and Periscope videos, and of course the “live” tweeting throughout the hearing, which gave people far away from Baltimore access to highly detailed, almost line by line, coverage. Some particularly high stamina credit is due to Jessie da Silva, Christian Schaffer, Justin Fenton, Mariam Khan, Seema Iyer and Amelia McDonnell Parry who all attended and reported throughout the entire 5 day hearing. Elsewhere on the wiki we have collated links to the best media coverage of this hearing and of the press conferences.